You can’t be a professional portrait or wedding photographer for very long without a steady stream of clients. A lack of clients means no sales, which means no revenue. Without cash flow, you can’t pay the bills, and your business will be forced to close down. The frustration of having to find new clients every day is tough, and it can sap your creativity because of all the stress and worry that comes along with it. Instead of struggling to get your name out there every day, wouldn’t be great if your own clients could do a lot of the heavy lifting for you by spreading positive word of mouth marketing about you and your photography? If that sounds attractive to you, this short book is designed to help you maximize your word of mouth marketing efforts. I created this “marketing short” for you to get some solid actionable advice in a quick and easy-to-digest format with zero fluff. This is especially useful as a springboard and starting point for anyone who feels overwhelmed or unsure of what to do first. I created this book for photographers of all levels who want to focus on serving the people they most love to work with and who love what they do. It’s for photographers like you who want to grow and build a loyal family of clients instead of wasting time worrying and feeling stressed out about where the next client will come from. As a photography marketing coach, I’ve helped hundreds of professional photographers over the last 10 years. The tips and strategies in this book are distilled from thousands of hours of hands-on experience, brought together in one convenient and easy-to-read book. If you follow what you learn, you’ll focus less on struggling to “get your name out there”, and more on creating your amazing photographs for your clients to enjoy for a lifetime. 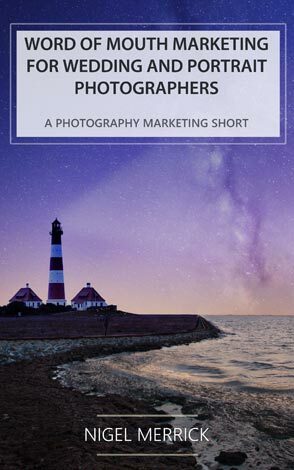 “Word Of Mouth Marketing For Wedding And Portrait Photographers” is available from Amazon as a Kindle eBook, which you can read on your Kindle device, smartphone, tablet, or computer. You can also get access to this book through the Kindle Unlimited program.